Decorate A Donut with Donut King! You Could Win Easter Show Passes and More! 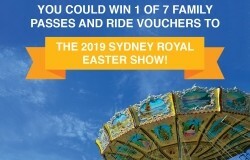 You could win 1 of 7 Family Passes and Ride Vouchers to the 2019 Sydney Royal Easter Show! Plus, we are also giving away delicious Chocolate Easter Packs. For your chance to win one of these prizes, simply scan your St Clair Shopping Centre rewards card daily between Monday 8th and Monday 22nd April, 2019. Each Family Pass consists of 2 Adults and 2 Children 4-15 years old entry passes to the 2019 Sydney Royal Easter Show. Each carnival coupon voucher is to the value of $96.00 (terms and conditions may apply to the use of the carnival coupon voucher). This prize is only valid for use for the duration of the 2019 Sydney Royal Easter Show. Chocolate Easter Pack prize consists of a 400g Chocolate Easter Egg Gift Box. Click through to the pdf below for full Rewards Programme Terms and Conditions.